Effective treatment for pancreatic cancer remains challenging, particularly the treatment of pancreatic ductal adenocarcinoma (PDAC), which makes up more than 95% of all pancreatic cancers. Late diagnosis and failure of chemotherapy and radiotherapy are all too common, and many patients die soon after diagnosis. 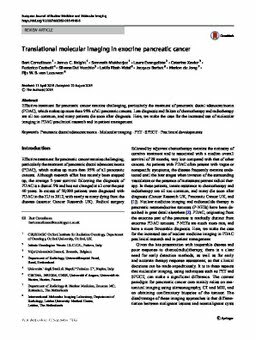 Here, we make the case for the increased use of molecular imaging in PDAC preclinical research and in patient management.